uvex: Jürgen, please explain your hobby in a few sentences and how uvex PPE products come into play. 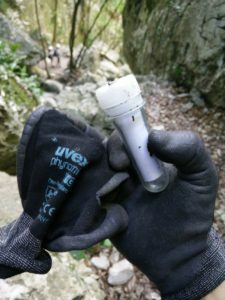 JK: Geocaching involves – as the name might suggest – locating plastic containers known as “caches”. For me, it is a hobby which, one the one hand, my wife and children also enjoy and, on the other, allows me to push my boundaries in many different ways. Yes, there are some caches which require little more than a short walk in the woods to find. But then there are also plenty which require weeks on end spent in front of a computer screen trying to solve the mystery. Soon you find yourself wandering around a deserted underground shelter at night, climbing up a 20-metre high tree or abseiling from a bridge. It’s such a broad spectrum – and obviously, the more adventurous caches increase the importance of having the appropriate protective equipment. Also, geocaching is an incredible opportunity to discover exciting places whose secrets would otherwise have remained totally hidden. Just a few weeks ago, I was near Lake Garda exploring an incredibly beautiful gorge with picturesque waterfalls and enchanted ruins – if it wasn’t for those small plastic containers, I’d have never even considered going down there! 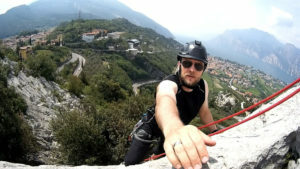 uvex: What kind of dangers and challenges do you encounter? JK: The main dangers are bugs and thorns – sometimes, you also need to protect yourself against damp, moist conditions and falling rock. 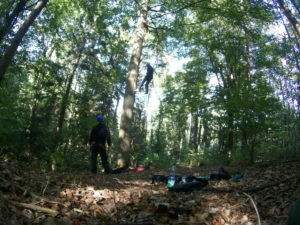 The biggest danger though is falling, for example if a containers is hidden on a climbing wall, a cave or up a tree. The challenges are equally diverse. You also need to carry some kit with you, be equipped and appropriately dressed for various situations, know exactly where you are going even in the dark, proceed with caution when walking (or even scrambling and crawling) when off the beaten track, and much more besides. JK: Over time, some consensus has formed on this topic: the standard equipment includes, for example, the uvex athletic workwear air-flow cargo trousers. The product is very robust, flexible and breathable. With many different pockets, the trousers are extremely practical – you can stow away lamps, batteries, GPS devices, pens and notepads, and much more. I also always make sure to have my uvex phynomic gloves with me. I am particularly grateful for these when I have to feel for something in a small, damp hole in the rock or find myself crawling around on slippery terrain. On the topic of “wet”: My uvex raincoat is always nearby, whether in my rucksack or at least in my car boot. If I am climbing or going into caves, I wear my uvex pheos alpine climbing helmet for protection – I also use this from time to time for mountaineering and sport climbing. Lately I have also been using the very effective self-tinting uvex sportstyle RX sports goggles. Of course, these are from our sports range rather than one of our health and safety products. However, they are the perfect product for maintaining optimum vision in forests, where the light conditions change frequently. uvex: Has using uvex products changed the way you practice your hobby? JK: It’s fair to say that uvex products haven’t fundamentally changed the way I enjoy my hobby. However, what they have done is to make geocaching much safer, easier and more comfortable. In general, since I started working for uvex, I have become much more conscious of the need for PPE, for example. Before this, I’d have never thought of wearing a protective helmet for tree climbing. We are very grateful to Jürgen K. for his contribution and are happy that uvex products also play a role in his leisure pursuits. We have uploaded some photos of Jürgen’s geocaching adventures in the gallery, which may even inspire you to give it a go! uvex is delighted that its industrial health and safety products are used in the private domain as well as professional working life. However, we are of course unable to ensure that the appropriate products are used for the respective activity. Therefore, uvex does not accept any liability for the accuracy, maintenance and correct application of its products and their condition, nor can it be held liable for non-uvex products.